Tea is India's national drink. No social occasion is complete without glasses of steaming masala chai being passed around; it is considered a certain cure for any ailment that you may have; and you will be assured that it will warm you in winter while cooling you in summer! Most Indians are surprised to discover that it has not always been this way. 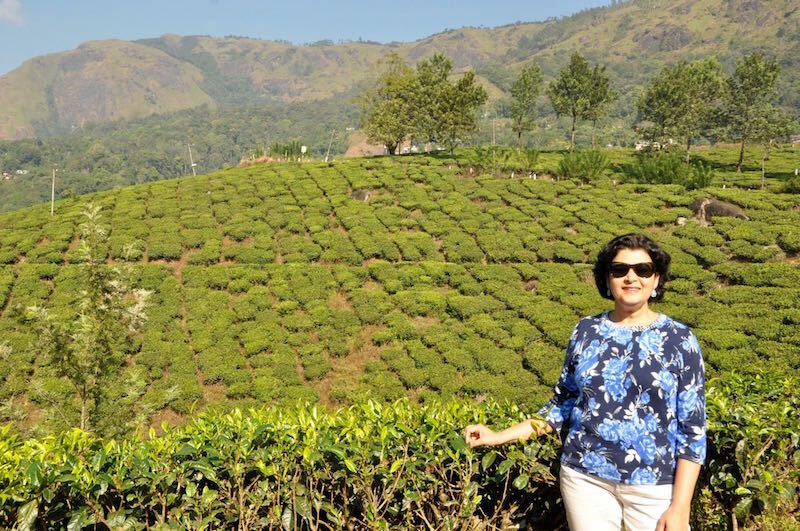 British planters started growing tea in India in the nineteenth century for export to Europe and by the late 1800s Darjeeling tea was prized around the world. At the same time very little was drunk in India itself. It was only in the 1920s that the Indian Tea Board realized that it was ignoring a potentially huge market and started vigorously promoting tea drinking across the country. Free samples of tea were given out in offices and factories across India and teas stalls set up at every railway station. Tea sellers were given careful instructions on how to brew a proper English cup of tea, but soon began to modify the recipe to better suit the tastes of their customers, making it much sweeter and milkier and adding ginger and spices. In spite of the horrified reaction of the English bosses of the Tea Board, masala chai was born! One of the place where British tea plantations were established was Munnar, high up in the mountains of Kerala, in the Western Ghats. With rolling hills as far as the eye can see, neatly cropped rows of tea bushes stretching out to the horizon, a pleasantly cool climate and stunning vistas at every bend, it is easy to see why this place was a favourite with the officers of the British Raj who came here to cool off during the hot summer months. These days Munnar is a popular destination for honeymooners, tea aficionados and adventurous tourists! Just driving around the steep and narrow mountainous roads, admiring the beautiful scenery and stopping now and then for breathtaking photos was fun enough for us! We often passed groups of women snipping tea leaves with large shears, slipping them into large bags slung over their backs while gossiping and singing loudly. Having seen this scene played out so many times in Bollywood movies, it was surreal to actually glimpse it in real life! Some of India's best tea is grown in this region with tea estates dating back to the days of the British Raj. We had a fascinating visit to the Tea Museum where we could see each stage of tea preparation from sorting fresh tea leaves, drying and finally tasting. Indian style tea is strong, aromatic, milky and sweet. Milk, water, sugar, crushed spices and ginger are boiled together, then brewed with tea leaves into a strong concoction that will put new life into anyone who takes a sip! Combine all the ingredients except tea leaves in small saucepan set over medium heat. Bring to a boil, stirring occasionally. Reduce heat to low and simmer for 5 -7 min until spices and ginger release their fragrance and flavour. Add tea, switch off heat. Cover pan and steep for 2-3 min. Strain into 2 mugs and serve.